Derek Sheils takes the chequered flag to win the Cookstown 100 feature race on the Burrows Engineering Suzuki. Derek Sheils doubled up to win both Superbike races at the KDM Hire Cookstown 100 on a day to remember for John Burrows’ team. Sheils was in irresistible form as he stamped his authority in the seven-lap feature race on the Cookstown B.E. Racing Suzuki, capitalising on his pole start to surge into the lead before opening a yawning gap over nearest challenger Derek McGee in second place on Noel Williamson’s BMW. The outcome was clear from the opening laps as Sheils established a lead of four seconds over McGee after three laps of the 2.1-mile Orritor course, who in turn was clear of newcomer Malachi Mitchell-Thomas in third on the Burrows’ Superstock Suzuki. The exciting Bolton prospect was being chased by William Dunlop on the MSS Kawasaki Superstock machine and Mar-Train Racing’s Dan Kneen, who concentrated his efforts on the Yamaha R1M Superstock machine after riding the full-spec Superbike at the Tandragee 100 last weekend, where the Manx rider won the main Superbike race. Sheils controlled the race from the front and had 10 seconds in hand at the finish over Mitchell-Thomas, who was gifted second place when McGee made a mistake and ran wide. Kneen also took full advantage of McGee’s mistake in the closing laps and gained two places to finish on the rostrum in third, also diving past Dunlop, who finished fifth. Brian McCormack completed the top six on the TAG Racing Honda. Earlier in the day, Sheils served notice of what was to come as he ran away with the Open Superbike race, again leading from start to finish. McGee clung on for the first three laps but Sheils gradually put some daylight between himself and the Mullingar rider, taking the flag by five seconds. Mid Antrim treble hero Mitchell-Thomas impressed once more in third, narrowly holding on by two tenths of a second from Kneen, with Waterford rider McCormack fifth ahead of Dunlop. The Supersport races were all about Ballymoney racer Dunlop, who had to bide his time in the Invitational opener – carried over from Friday evening – after McGee set the early pace on his Yamaha R6 from Mitchell-Thomas and James Cowton (Honda). Dunlop, fifth on lap one, soon scythed his way through as McGee and Mitchell-Thomas, who quickly moved into second place, began to break away at the front. By half-distance, Dunlop was looking menacing on the CD-IC Racing Yamaha and the Tandragee winner swiftly dispatched the two frontrunners before putting the race to bed, opening a lead of 1.4 seconds with clear track ahead of him. The race was red-flagged on the final lap when Mitchell-Thomas crashed out unhurt, although the 20-year-old would miss the second Supersport race due to the damage sustained to the Burrows Honda. The result was declared based on positions at the end of lap four, with Dunlop victorious by three seconds from Kneen, who came through for second place following a mistake by McGee, who completed the top three. Paul Jordan, Cowton and Michal Dokoupil rounded out the first six, with Mitchell-Thomas excluded from the results due to his crash. In the Irish Championship 600 race, Dunlop again left himself with some work to do but quickly assumed control from early leader McGee and completing his double on he R6 by almost three seconds. Kneen finished on the podium again on the Mar-Train Yamaha in third behind runner-up McGee, with Cowton, Jordan and Dokoupil next. Magherafelt rider Jordan was streets ahead in the 125GP/Moto3 race, which he won by four seconds from Adam McLean and Sam Wilson, while circuit newcomer Gary Dunlop finished seventh behind Paul Robinson after running as high as third during the race. 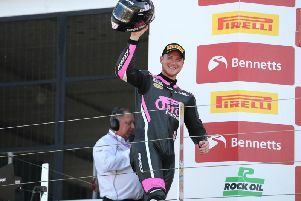 A thrilling Supertwins race fell to Mitchell-Thomas, who had been locked in battle with team-mate Derek Sheils until the double Superbike winner lost three places on the penultimate lap. MMT had a second in hand at the line over Cowton, while Dokoupil finished third ahead of Jordan and Sheils. James Chawke and John Horgan were the respective winners of the Junior and Senior Support races. Don’t miss Monday’s News Letter for a full review of all the action plus Keep ’er Lit on Tuesday for more reports and analysis from the Cookstown 100.